People think that risotto is hard to make. And it is, but only if you use one of those recipes that has you standing over the stove mixing the wine and chicken stock and adding ladlefuls each time the liquid is absorbed. One of my favorite people ever, Ina Garten, just makes her risotto in the oven. So easy! Especially if you have homemade vegetable broth in the freezer, like I always do. 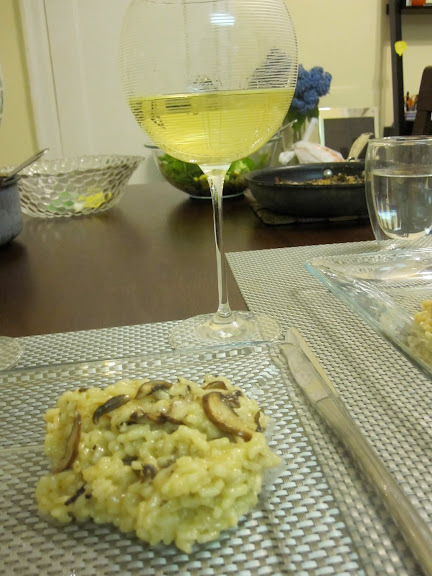 Risotto has a reputation of being impossible to make. You have to sit there and stir constantly, your arm tired and burning over the hot stove. Well, I’m here to tell you that this is not the case! Making risotto can be easy, and doesn’t take so long. I thought I was taking on a much harder project than it turned out to be. I found this Cheese Guy brand kosher Parmesan cheese at Fairway supermarket. It’s expensive stuff, and I think I used too much of it. I’m not a big cheesy person, so I halved the amount of cheese the original recipe called for and I still thought it was too cheesy. I trust you know your own taste buds and will adjust accordingly. Next time I think I’ll make a vegan risotto. Is there such a thing? Melt half of the butter and the olive oil in a large skillet over medium heat. Saute the onion until it begins to turn color, about 2 minutes. Add the rice and stir to coat, then slowly add the wine. Bring it to a boil and cook until the wine is reduced by half. Season with salt and pepper. Add 1 1/2 cups of stock and let simmer for about 8 to 10 minutes, until liquid is almost absorbed. As the liquid absorbs, add the remaining stock 1 cup at a time, stirring frequently. The risotto should be creamy and the rice should be al dente. Meanwhile, melt 1 tablespoon of the butter in a small skillet and add the mushrooms. Season with salt and pepper. Saute until they release all of their liquid and turn a golden brown color. Set aside. Stir the last tablespoon of butter and the cheese into the risotto. Serve the risotto topped with the mushrooms, or mixed in. Enjoy with a glass of the same wine you used to cook with!